Elegant Findings Antiques has an extensive selection of rare antique Meissen blue onion porcelain items that are hard to find. We have large trays, figural salts, two section bowls, four cornered bowls, platters, gravies, reticulated compotes and bowls. 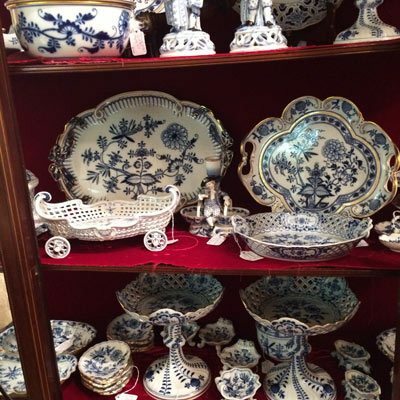 We hope you will enjoy looking at our wonderful selection of antique blue onion Meissen china. 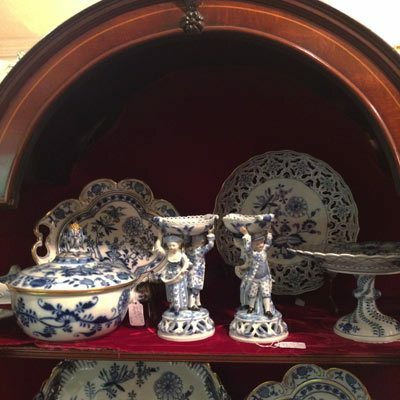 When you shop at Elegant Findings Antiques, you will find Meissen blue onion porcelain that you have been looking for and have not been able to find anywhere else. 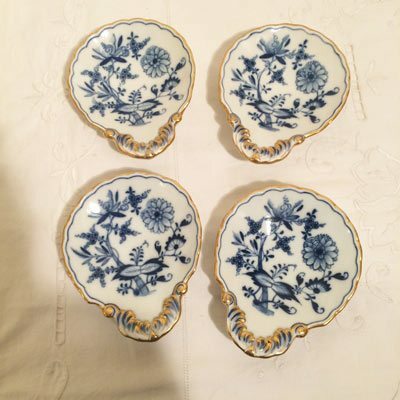 Elegant Findings Antiques searches for rare Meissen blue onion items in wonderful condition that are antique. 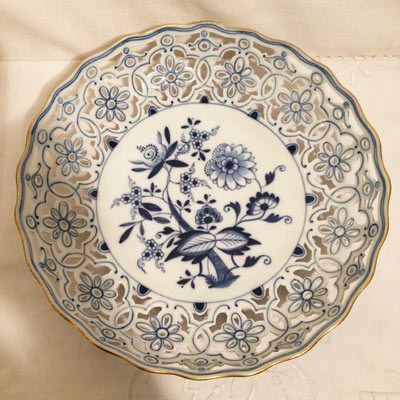 Even the antique Meissen blue onion porcelain looks like new after it is used frequently. 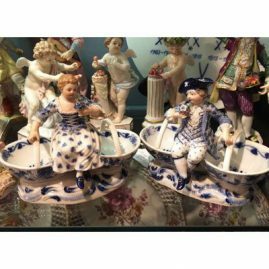 The Meissen company has perfected its hard paste glazing by glazing the blue onion porcelain twice at very high temperatures. 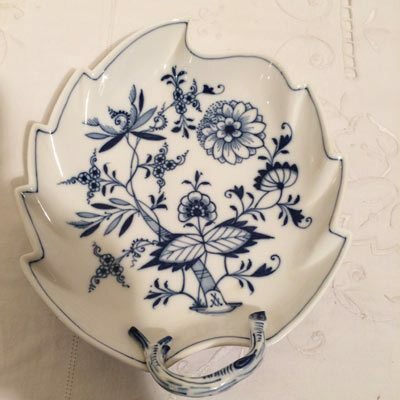 This means you can use it without it showing grazing or scratches, as other porcelain does after it is used a lot. Right now, we have a fabulous selection of Meissen blue onion. 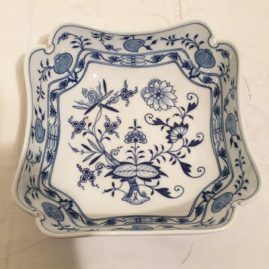 Many of these pieces are so unusual that I have not seen them before in my thirty years of experience. Elegant Findings Antiques has specialized in Meissen porcelain for thirty years. 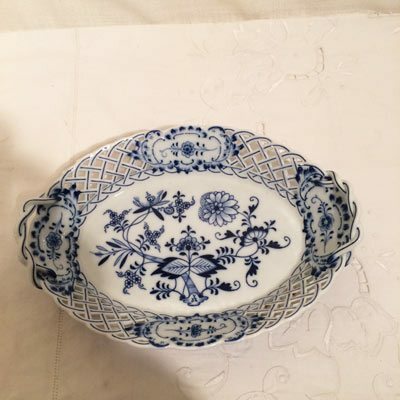 That is why we are very selective in choosing fabulous pieces of Meissen blue onion. 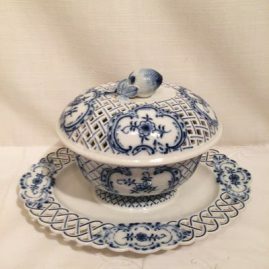 Meissen blue onion display with rare tray, reticulated compotes and salt cellars. 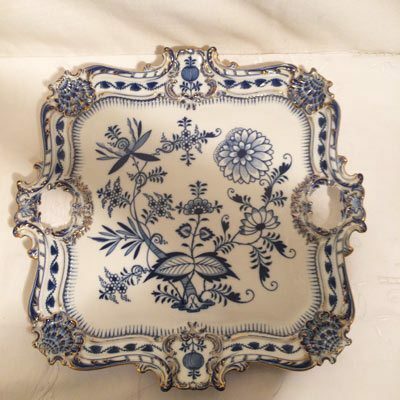 Please look at the gallery to see the items in detail. 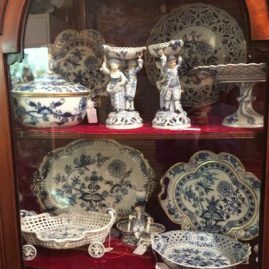 Display of rare Meissen blue onion china with serving pieces, figural salts, reticulated bowls and fabulous trays. 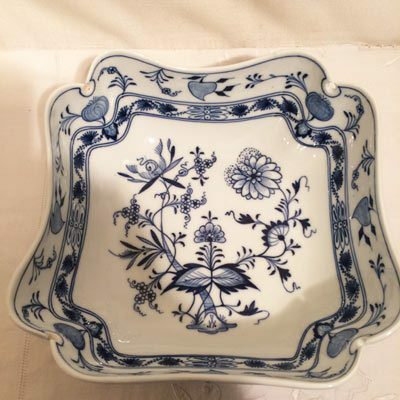 Please look at the gallery to see the items in detail. Meissen blue onion dinnerware display with figural salts, serving pieces, reticulated bowls and rare trays. 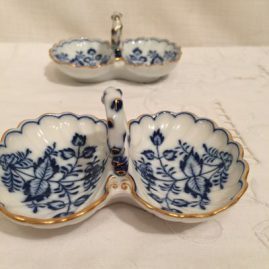 Please look at the gallery to see the items in detail. 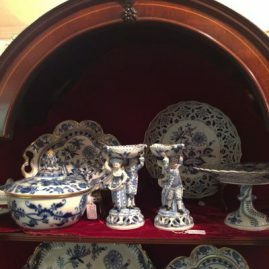 Showcase showing a selection of antique Meissen blue onion china like Meissen trays, reticulated bowls, reticulated compotes and selection of salt cellars. 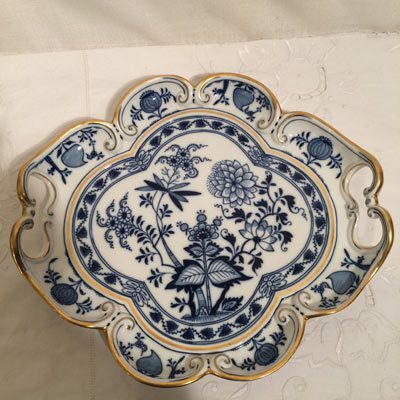 Please look at the gallery to see the items in detail. Pair of Meissen blue onion figural master salt cellars of a lady and a man, each piece has reticulated tops and bottoms. Circa-1870s-1880s. 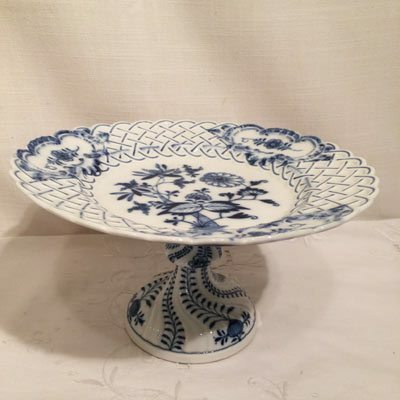 7 5/8 inches tall, length-6 inches and depth 3 3/4 inches. Sold. Very rare Meissen blue onion serving piece with wooden handle and fancy top, before 1890s. Length-17 1/2 inches, height-9 inches, depth-9 inches. Price on Request. 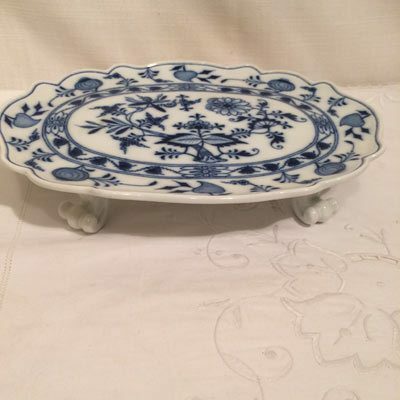 Beautiful large rectangular Meissen blue onion tray with gold rim. 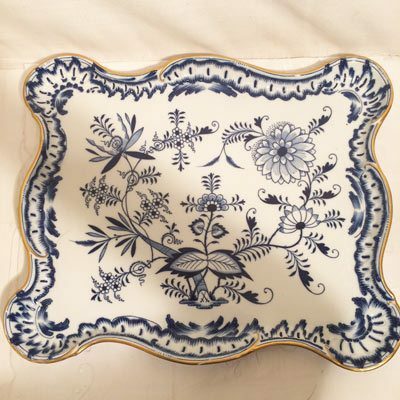 Circa- 1890s-1920, 17 inches wide, 14 1/2 inches tall. Sold. 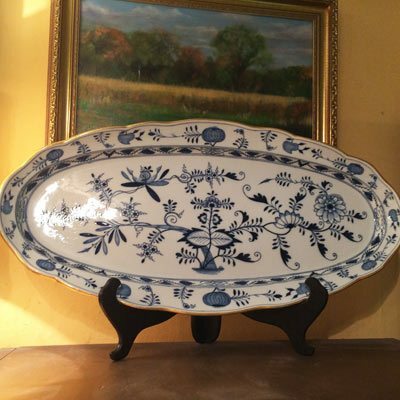 Large Meissen blue onion fish platter with gold rim, before 1890s, length-24 3/8 inches by 12 inches tall. Sold. 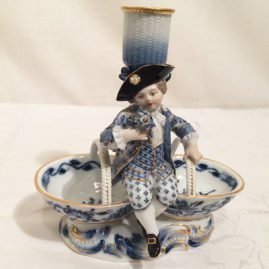 Rare Meissen double salt with candlestick and figure of a boy. Circa-1880s. Height-6 inches, width–6 inches. Sold. 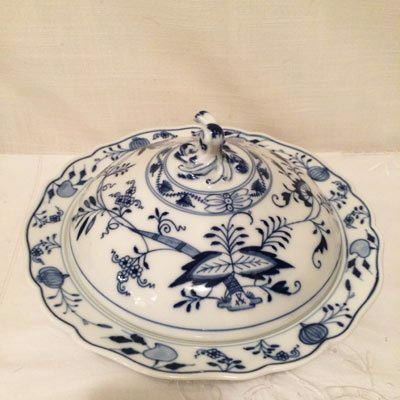 Rare Meissen blue and white gravy with reticulated top and bottom and with fruit on top. Length-12 inches, depth-8 6/8, height-8 inches, Sold. Rare Meissen blue onion reticulated bowl in the shape of a truck with raised forget me nots on outside of bowl. Circa-1890s-1920, Length-11 inches, depth-5 inches and height-4 3/4 inches. Sold. Meissen blue onion compote. Circa-before 1890s, height-5 1/4 inches, diameter-9 3/8 inches. Sold. Beautiful rare Meissen blue onion tray with gold border. Circa-1890s-1920. Length-11 1/2 inches, height-101/2 inches. Price on Request. 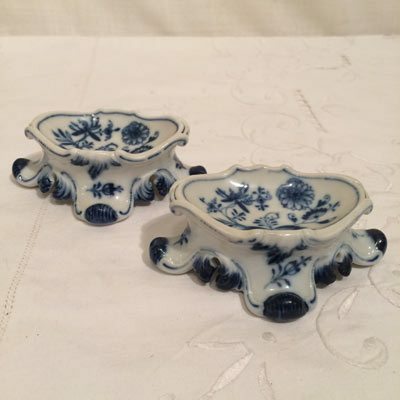 Two fabulous rare Meissen blue onion square trays with gold rim. 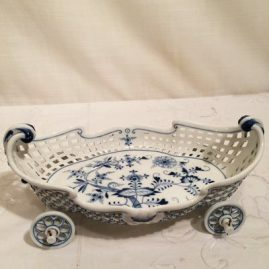 We have two of these rare trays. We are selling them separately. Circa-1890s-1920. width-16 inches by 15 3/4 inches long. Both are sold. 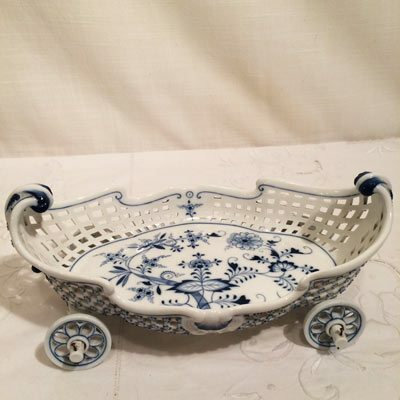 Wonderful rare Meissen blue onion tray with bows and gold rim. 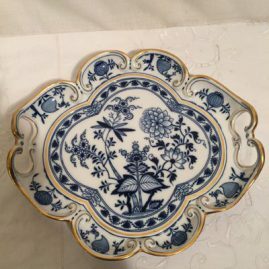 Circa-1890s-1920. Length-16 inches and height-11 1/2 inches. Price on Request. Meissen blue onion serving piece with four raised feet. . Circa-1890s-1920. Length-10 1/2 inches, depth-8 inches, height 2 inches. Price on Request. 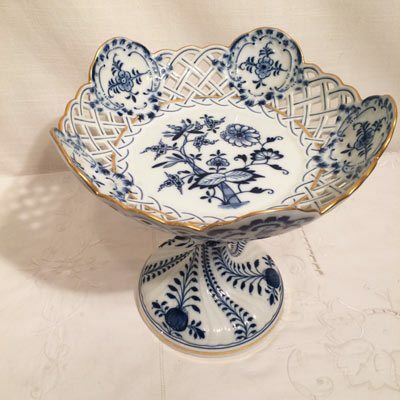 Fabulous tall reticulated Meissen blue onion compote with gold rim. Circa- before 1890s. Circumference-8 3/4 inches, height-9 inches, Price on Request. Meissen blue onion reticulated bowl with gold rim. Circa-before 1890s. Diameter 10 3/4 inches. Sold. 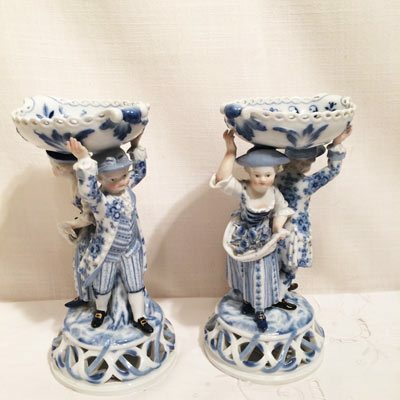 Pair of Meissen blue onion double salt cellars with figures of a boy and girl. Circa-1880s. Sold. 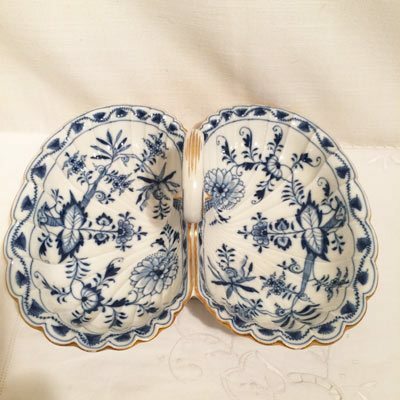 Two Meissen blue onion two section bowls with gold rim. 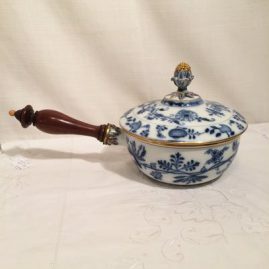 Circa-1890s-1920, 11 inches wide, 9 5/8 inches deep and 5 inches tall to handle. Price on Request. 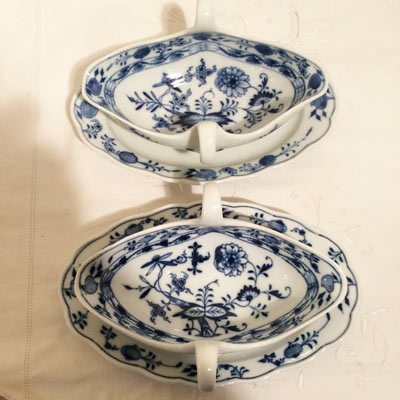 Two Meissen blue onion four cornered bowls. Circa-1923-1933. Width-7 inches, depth-7 inches and 3 inches tall. Sold. Meissen blue onion covered pancake or butter dish. Circa-1923-1933. 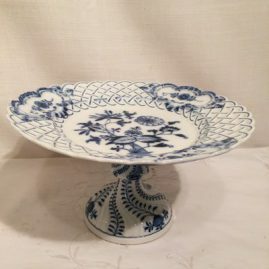 Diameter-91/4 inches, Height-6 inches. Price on Request. Two Meissen blue onion double salts. 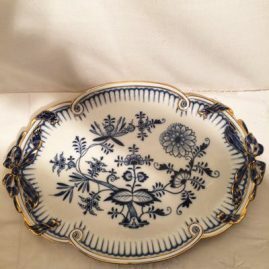 Circa-1890s-1920. 4 1/4 inches long by 3 inches tall. Price on Request. 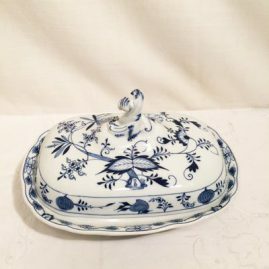 Meissen blue onion four cornered bowl. Circa-1890s-1920. 8 5/8 inches by 8 6/8 inches. Sold. Meissen blue onion leaf shaped dish. 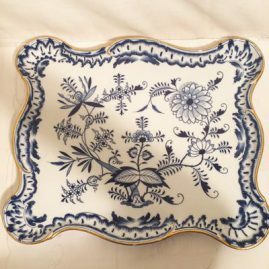 Circa-1890s-1920. 8 6/8 inches long by 7 1/4 inches deep. Price on Request. 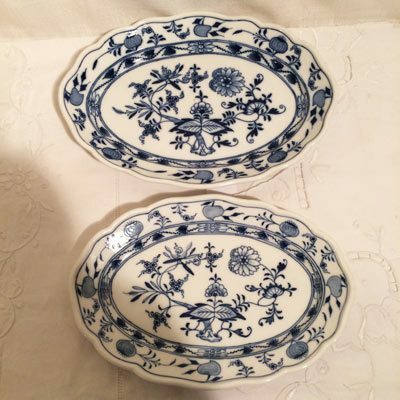 Two Meissen blue onion smaller platters. Circa-1890s-1920. One is 10 inches long by 7 inches tall; the other is 9 inches wide by 6 inches tall. Prices on Request. Two Meissen blue onion gravies with attached under plates. One of them is from 1890s-1920 and the other is from 1923-1933. Length-9 inches, 6 1/2 inches deep, and 3 1/2 inches tall. Price on Request. Seven Meissen blue onion handled servers. Late 19th century. Length 5 1/4 inches, width-4 3/8 inches. Prices on Request. 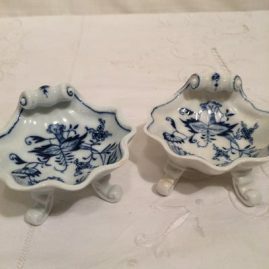 Two Meissen blue onion salts. Circa-before 1890s. Length 4 inches, width-3 inches. Sold. Four Meissen blue onion shell shape salts on four raised feet. Late 19th century. Sold.